Indian candidates belonging to the General/OBC (Male) have to pay application fee Rs.100; while SC/ST/PH and Female candidates need not to pay anything. There will be no written examination for the selection. Department is going to select candidates on the basis of 10th class marks. Department will make a merit list on the basis of 10th class marks. So this is a great opportunity for all candidates who score good marks in 10th class examination. The process for applying this India Post recruitment is to apply Online. 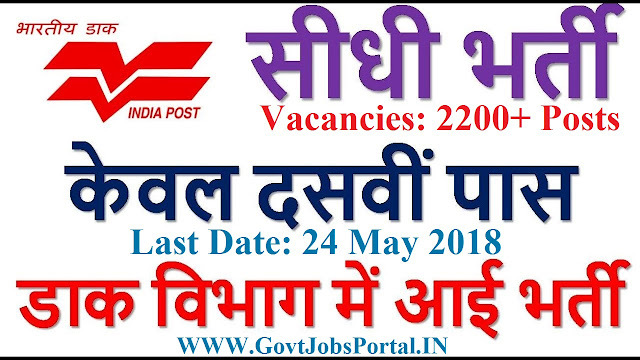 Directly visit to the India Post department website, for online application form link. You can also check IMPORTANT Link section below for direct application form. All the best to all the participants. 25th April 2018 is the Starting Date to Apply. 24th May 2018 is the Last Date to apply online.